1 of 4 Heat broiler. Spray a broiler pan with nonstick cooking spray. 2 of 4 In a large bowl, mix together turkey, green pepper, mushrooms, egg, bread crumbs, ketchup, minced onion, Cajun seasoning and garlic powder. Form into 4 burgers, about 3 inches in diameter. 3 of 4 Place burgers on the prepared broiler pan and broil for about 5 minutes per side or until internal temperature reads 160 degrees on an instant-read thermometer. 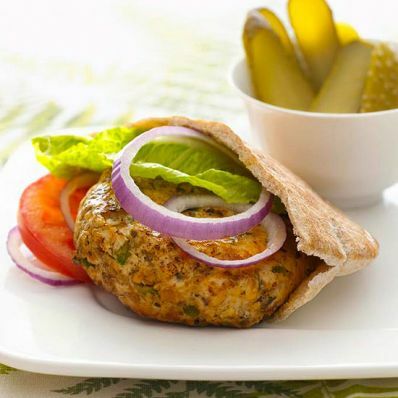 4 of 4 In each pita half, place a burger, a slice of tomato and a slice of onion. Serve with additional ketchup and pickles, if desired. Per Serving: 3 g sat. fat, 142 mg chol., 719 mg sodium, 4 g fiber, 12 g Fat, total, 29 g carb., 27 g pro., 325 kcal cal.